Some foods, regardless of who you are or what you do, have the potential to be painful while chewing. Some of these include taffies or other dense, chewy foods, along with hard candies or brittles, which we advise you not to chew anyway. Hard foods can cause strain to the teeth, potentially cracking them. Chewy foods like taffy cause the teeth to stick together, potentially causing them to ache and pull as you chew. These foods can be eaten, but carefully and in moderation. If you aren't sure if your teeth are strong enough, ask! However, if you find that your teeth continue to ache when you chew nearly any food, maybe it is time to schedule an appointment with us. If you find that it is common to experience tooth or jaw aches while chewing, it could be a sign that something more is going on. First, look for a pattern. If you notice pain only chewing cold or warm foods, it may be a tooth sensitivity issue. If you find that it occurs only with candies, it may have to do with sugar. Keeping track of food similarities is a good practice, and will help us find the best solution for your problem. Keep an eye on textures as well. If you find that chewy foods tend to hurt, perhaps it could be a crack or fracture that becomes irritated as food infiltrates the fissure. Be sure to know how long the pain has been occurring, and if you have had any weakness in the tooth before, as those are questions our doctors will want to know. While it could be no big deal, it could also be a sign of something that we should remedy as quickly as possible. Pain should never be ignored, and if you are worried this might be a problem with the integrity of your tooth or jaw, be sure to come in as soon as possible. We will track down the source of the pain so that we can hurry to make it stop. 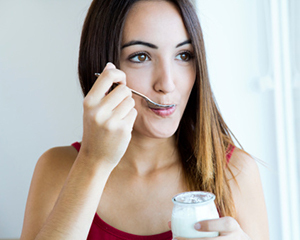 In the meantime, eat soft foods such as smoothies, yogurts, pasta, or soft fruits. Soft foods put up the least resistance and should limit the pain you experience until you can come in!